Hello hello! I am still plodding along on my plastic free journey but have been mired down at work with snagging and lots of paperwork so spending more time in my computer blogging has been the last thing on my mind. Today I’m catching up on chores and breaking up the tasks by blogging . It’s been an interesting few months here with a new Prime Minister. In the run up to the elections there was a lot of talk on environmental issues. Hopping on board, one chain of supermarkets took a poll to ask if people would like to be charged for plastic bags. There was a lot of backlash from people wanting rid of them (probably the more vocal crowd rather than the majority). And then the rival supermarket chain announced they would go single use plastic bag free from 2018. Since then New World, mitre 10 and Z Energy all have announced they too will ban single use plastic bags. It’s a great step forward. People will grumble but they’ll soon get used to it. I’ve also noticed produce bags for sale in all the supermarkets. This morning, there was a stall selling homemade ones at the waterfront market. Beeswax wraps are for sale in every Homeware and gift shop as well as at all the local markets. And stainless steel or glass drinking bottles are overtaking plastic ones on the shelves at stores. 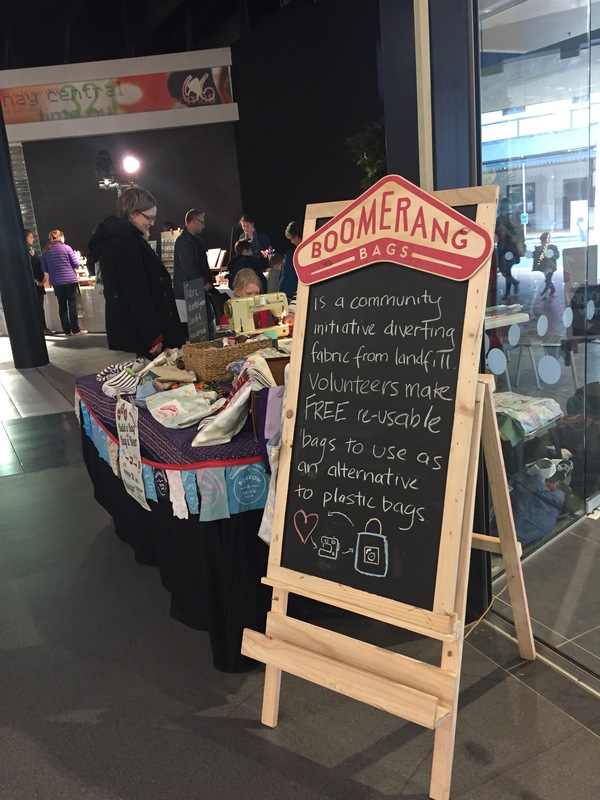 There’s even a boomerang bag make your own stall at the craft central market, complete with sewing machines. While I was at Craft central I spotted Lambert’s beard oil was selling metal razors. I had just run out of razor blades for my 12 year old Gillette Venus razor. There’s some plastic in the replacement Gillette blades but there’s so much more in the packaging. The safety razor blades come wrapped in paper., so I decided to overlook the plastic case and buy a metal razor. (I had checked other places – they are hard to find and I didn’t find any plastic packaging free) I have to admit it’s not as ergonomic for shaving legs as the Gillette one but there’s a lot less plastic involved. I’m just vain enough that I don’t want to bare hairy legs in Summer! 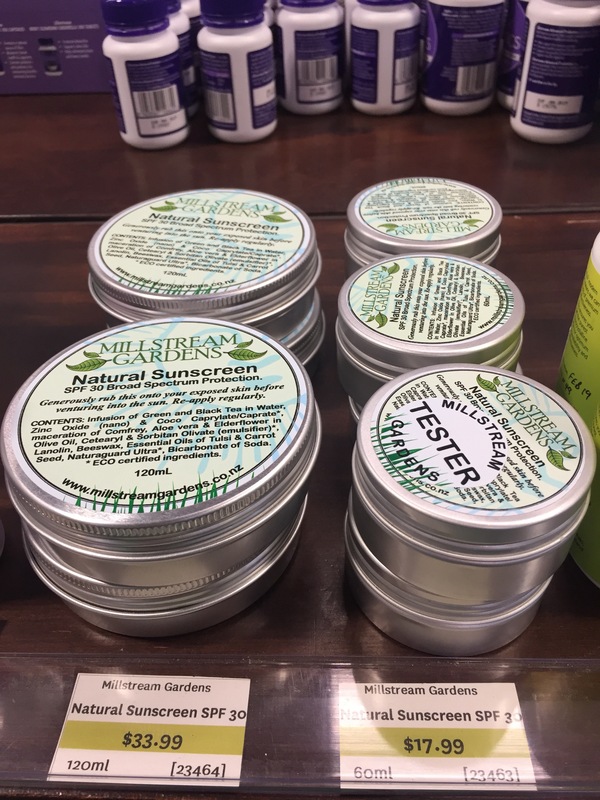 Speaking of Summer, I have yet to come across a tested plastic free sunscreen. There are lots of recipes and small businesses making them but none have been tested as far as I can see. New Zealand has one of the highest rates of skin cancer in the world and with my fair skin, I’m not taking any risks and will stick with the mainstream ones. Edited. After posting this, I went out to buy some bread and found this. It smells a bit odd but ticks all the boxes so I shall give it a try when I run out of my current supplies. I like the face it’s in a tin rather than glass so it’s easier to carry around. I have been looking for more goat’s milk soap and finally found some – in a little town called Kimbolton – when I was away for the long weekend over Labour day. I stopped for coffee in Hansen’s cafe and store and was delighted to find goat’s milk soaps and also shampoo and conditioner bars. The coffee and date scone was great too. Soap is definitely something that people need to rediscover. The mass marked ones sold in the supermarket are full of palm oil and chemicals but outside that there’s so many different types. Less packaging, longer lasting and as long as you let it dry after use, it’s pretty waste free. 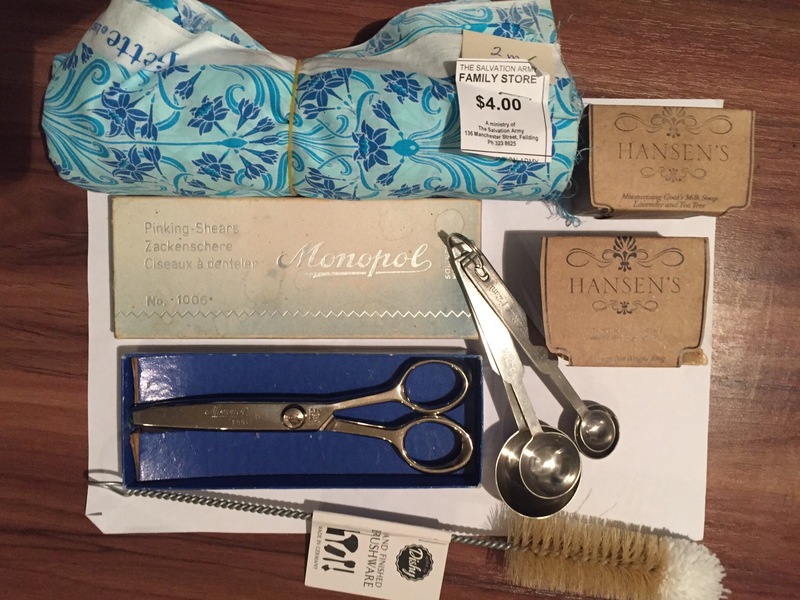 On the same trip I made a few other purchases – some measuring spoons for 20c, 2m of cotton for making beeswax wraps and something I’d been looking for for ages- some metal pinking shears (to cut the cotton for beeswax wraps) – for the reasonable price of $25. The brush bottle is for cleaning my little milk bottles when I freeze milk. Since my last post, I’ve I had some food wins too. My favourite Indian takeaway had no problem letting me use my own containers for a takeaway. After a very long week at work it was a great relief and it’s nice to know the option is there if I want it, though to be honest I’m not a big takeaway eater. Übereats won’t be making any money from me! 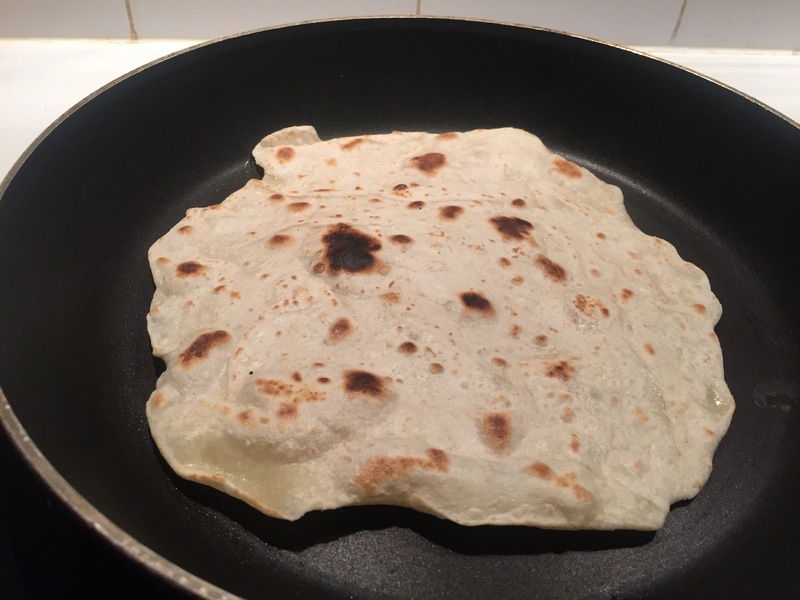 I’ve also found a tortilla recipe that works. It’s really easy but I discovered that you really need a flat griddle rather than a frying pan. As you can see by my rather ragged attemps, I haven’t yet mastered the art of rolling the dough into a circle. The other thing I ran out of in the last few months was clothes softener. Google suggested vinegar as an alternative but after itching and having red sore skin along seams (the reason I use conditioner), I concluded this wasn’t a solution for me. It does seem to work for a lot of people. More googling prompted me to add a 1/2 cup of baking soda to the wash during the rinse cycle. This works well for me but means I have to keep a close eye on the washing machine so I add it at the right time. Next up is finding a recipe for a conditioner that I can add when I put the wash on and leave it be. Great work Catherine! You have me convinced I need to do more! So much exciting stuff happening in NZ lately environment wise, gives me hope!! Nice op shop find by the way. I’ve been buying goat soap here too. It’s sold unpackaged so just the soap, no plastic! My roti always turned out Indian shaped but I like to think that is just to remind me of India! There was an article in the Guardian today about “UK environment department using 1,400 disposable coffee cups a day” (I’m sure if you google it you’ll get the link). I found another source of goats milk soap in Wellington with a sea salt and activated charcoal one. It’s much better for my oily skin. The other one was a little bit too rich. Love the idea of India shaped roti. Though Naan bread are often that shape too, I’d never thought of them as ‘India shaped’. A lot of office buildings have plastic cups at water dispenser that get thrown away after a couple of sips. That’s even more wasteful than coffee cups!